Welcome to Grand Explorations Travel Agency! I'm Rene Prasad and I'm so glad that you're here! When you book your vacation or honeymoon with Grand Explorations, you are really booking with me. After many years of working for other people in corporate America, I decided to start my own business and do something that I really love. One thing that I've noticed is that a lot of people don't use a travel professional - some because they prefer to do the planning on their own but there are a lot of people who have worked with a travel professional in the past and didn't have a good experience. I personally have been in that situation myself where it seemed as though the person didn't really care about me or my trip, just about the money that they were making off of me. I strive to be a different kind of travel professional - I really and truly care about my clients and that they have an amazing trip. To me, there is nothing greater than seeing Facebook and Instagram posts from my clients having a blast or hearing how much they loved their vacation after they are back at home. I've got a whole list of travel certifications, which I may list here someday, but the bottom line is that I care about making your trip perfect for you and I will work tirelessly to make that happen. I'm originally from Chicago but I call Connecticut home now. Go Cubs! I'm the oldest of four girls. My dad is a VERY lucky guy...with selective hearing. I have a beautiful daughter, Sabrina. She's always been one of my favorite travel partners, other than for a few years when she was between 15-18. Moms of teenage daughters will totally understand. I've got an incredibly understanding boyfriend, Ralph, who doesn't bat an eye when I tell him I've decided to go to China for a quick trip...by myself. We've been together for 11 years now. 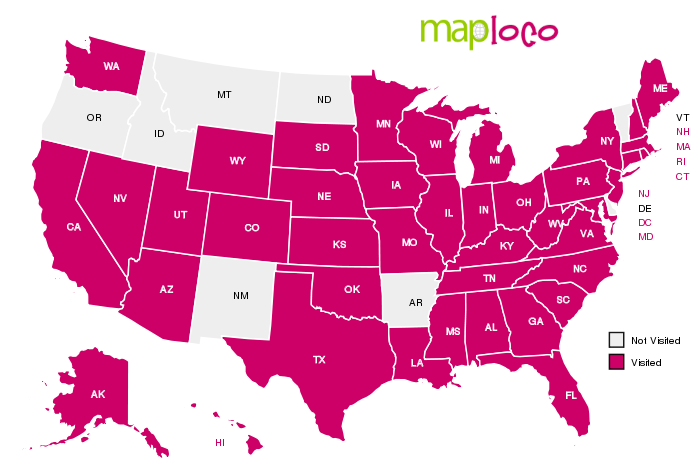 My goal is to visit all 50 states. I've only got eight left and plan to cross off at least two more this year - Vermont and Delaware. I am open to suggestions on what to see in either of these states although I'm pretty sure the Ben & Jerry's factory is on the list. I love great food and wine, which I indulge in as much as possible. I love to cook and bake. My food doesn't look pretty - I'm terrible at plating and decorate cakes and cookies like a small child - but it all tastes pretty good. I love the idea of yoga. I mean, I love doing yoga, just lately it's been more in my head than in real life. I really like yoga clothes, well mainly yoga pants. I really enjoy hiking and am lucky that there are some great trails here in Connecticut. I love reading cheesy romance novels. And I'm so glad that because now that I read mainly on a Kindle, I don't have to be embarrassed about strangers seeing the cover of my book. Now there's a chance that they think I'm reading something intellectual!